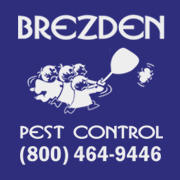 Brezden Pest Control has been a family owned and operated business since 1980, building a reputation based on trust and reliability. Founders John and Maria Brezden and their son, John, have been building a team of well-trained service technicians and office staff that work together to find you the most environmentally friendly way to control pest and termite problems, rodent problems and within and around the exterior of your property. Everyone of the staff were professional and helpful. No one likes to deal with termites, but they made the process easy. My husband and I both would recommend this company and their staff. We live by the coast so spiders are a big problem. Brezden comes out monthly to to de-web and spray the exterior. We've had a couple instances where we've asked them to come out in addition to their monthly visit (black widow babies in our bathroom!, lots of webs around our deck) and they came out immediately and took care of the problem at no additional cost. They are dependable and responsive. They also fumigated our house several years ago. It was done quickly, with no fuss. They even bagged up some items we didn't think to bag up! Very professional, helpful and knowledgeable. Great service!! From beginning to end everyone was kind and helpful. Would highly recommend. The technician was prompt and professional. The technician did not go inside and there were still ants in the drawers. Please f/u with the daytime caregiver M-Thurs. Can you treat under the sinks? This is an ongoing problem that is not fully addressed. I am happy with the response but not the thoroughness of your procedures. Please advise. Your service technician, James, was professional and courteous. He explained clearly the work he was to complete. Very satisfied with the service we received. Everything that was done made me very happy knowing how many rodents we have on our property. Brezden was fast and professional on getting my elderly mom's house treated for termites. They did my house 2 years earlier, same prompt service. Very easy to communicate with and always reach a human on the phone. Thank you! Dresden keeps all the unwanted critters away! Very reliable service. Far superior to the competition! Ray is alaways a great help. Friendly, professional and informative. Clarified what needed to be done to detail and completed all work on a timely professional manner. Happy with John who provided emergency services and with David coming the next day. Also with Curtis who came on Wednesday to finish the traps and spraying. A great team. Also with Michael who did the initial evaluation. I am very happy with your company and personalized service!! Your worker arrived in a timely fashion, appeared competent in what he was doing and was very courteous. We have used Brezden off and on for many years and have been quite satisfied with their results. Thank you. Always professional. Everyone is friendly and helpful. This was a great experience. The Josh and crew members were punctual, informative and friendly. I am very pleased. Things were done with courtesy and professionalism. And the termites are nowhere to be found. Quick professional and great service. Had an issues and it was very time sensitive. Tech came out confirmed the problem and scheduled the abatement. Have used Brezden for many years. Good prices, good service, good results. Great company fantastic service. Gave them my personal business treatment was a breeze. I have been working with them professionally at work for 30 years. No complaints. Same owners all these years. Honest dependable. Thanks to Juan and all office personnel for making my experience with ants as pleasant as possible. Juan is a real gentle man and professional. Ants all gone --- you are a wonderful company. Friendly knowledgeable staff & great service. Technician explained everything on initial visit. I had one company that didn't even call me back but Brezden jumped right in and took care of the problem! Thank you! Fast, thorough,fair pricing and excellent work done by very competent and personable staff. Recommend Brezden enthusiastically. Wish I had tried them earlier. Our skilled Association manager who has a good knowledge of local vendors recommended them to us. I hate to say this, but he's always right. Great, consistent and courteous service. Very professional and accommodating to quickly complete a review of our house for a loan. They then followed up with a contractor to complete repairs needed in a timely fashion. From our first contact with James, the inspector, to the removal of the tent, Brezden was right there to answer all questions, give us clear instructions, and to give us really good service. Now we are termite-free! We are so very happy with the employee you sent to our house. He was very enlightening regarding the ant problem. His work was done with excellence. I recommend Brezden Pest Control for all of your pest problems. Good service and friendly staff. Would highly recommend this company. Great job and a great employee! Satisfied with service thank you!